There is a reason why despite being a restaurant, Tempo Doeloe is one of the top attractions in the city, and that is its ‘must have’ food. What started about 30 years ago as a simple appreciation for Indonesian cuisine and fondness of serving good food to the people later evolved into this dining hotshot in the bustling city of Amsterdam! Today, it sees a lot of visitors (including many foreigners) who come here to have a taste of Tempo Doeloe authentic Indonesian touch. The place was established by N.F. Ghabriel and draws hundreds of diners every day. The rustic decor and homely vibe only add to it, making it a great place to come with closed ones and dine. Ensure to try it out while you are in Amsterdam! How popular is Tempo Doeloe? People normally also visit Hermitage Amsterdam while planning their trip to Tempo Doeloe. We have been at your restaurant last Sutarday for dinner. After waiting over 1 hour and twenty minutes not being served, we've been asked if we want to pay by cash or credit card. So we decided to leave the restaurant. Never been in such unprofessional place before. We expected the best but experienced the worst. Shame. Very slow, not impressive and mediocre food.. and bad service. Better go when fed and hydrated! By all means, there are way better and tasty places that can offer value for money. This was a rip off based on historical popularity. By the way, I asked for simple tap water, and they serve "only mineral water".. or just stay thirsty. Really? What kind of a theft is that??? I'd give it six but some might not like the awful delays getting in( Door closed. Rang bell four times. No answer. Let self in by grabbing a handle at base of door. Not welcomed when we eventually got in),a seat(even when you've booked), ordering meal,desserts, the bill. Sometimes it's hard getting a smile out of any of the staff but to be fair, they were in a good mood this time. Great food. Don't eat for 24 hours before. Visit a coffee shop before. Share a full reijkstaffel if you're brave, or do a reduced version only about 10 dishes. )Regarded as being one of the better Indonesians. Blau is good but not as much fun. This is Amsterdam so it's not cheap. Dont worry. Be happy. Be prepared to feel like Mr Wobbly for a day or so. We had to have rijsttafel during our quick visit to Amsterdam and this is there we were directed for among the best. We loved it! 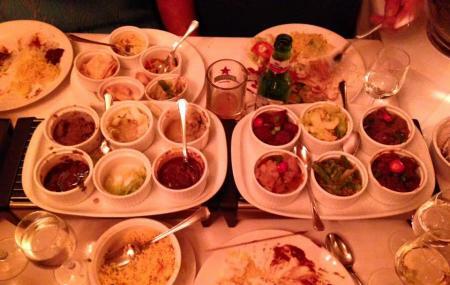 We had the 24 dish plate and our taste buds were tantalized by the most delicious and savory meat and veggie sauces. It was a sensory experience that left us satiated and glowing. Yes, we paid for water, and wine, but do not regret a penny spent there. Next time we are in Amsterdam, we will reserve early as we just graciously slipped in at the last minute. Love this food. First time revisiting after moving abroad many years ago and its just as good.